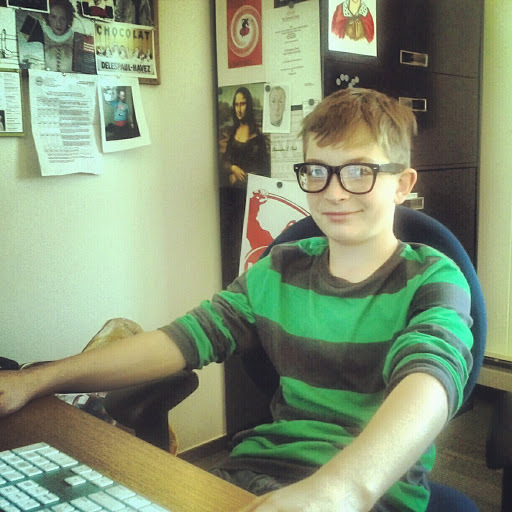 My son Owen is doing a job shadow with me today. It’s been super exciting! For me. I can’t answer for him. I think my job is awesome, but Owen is suspiciously quiet. I keep asking him “well whaddya think” kind of questions and he is sadly non-responsive. He’ll say “good” or “weird,” and he’s totally right. My job is generally good and frequently weird. So far today we have answered a bunch of emails and ate a lot of candy. Then we watched a play called Androcles and the Lion, where we learned that if you are angry you should ROAR and if you are rich and stingy and a woman, you will have a big ugly nose. We watched this play with about one hundred kids UVU bussed in, and these kids felt free to yell random (usually not helpful) things out. After the play Owen and I were hungry. So we went to lunch. Here Owen learned that if you have to eat fast food you should get your hamburger from Wendy’s, your fries from McD’s, and your drinks from Maverik. Because that’s what we did! Next Owen watched another play with me. This was called Zapatos Magicos de Pedro, and it’s another show for kids about a young Mexican who finds some magic shoes and tricks people into giving him money. There was a girl who would stand on her hands and then her legs would turn into a cactus. Owen enjoyed this play, and was particularly delighted whenever the pan flute would play and the Baby Jesus puppet would hover over the stage. Again, this is my job. I can tell that some of my colleagues want to come into my office and raise a little Cain today, but they are nervous because Owen is with me. They don’t want to scare him or belittle me in front of him. I appreciate their restraint, and I appreciate a little time off. I would like to bring him with me to work every day. All he has to do is sit on my couch and play games on his iPad and I’m spared all kinds of conflict. After Pedro Owen watched some students film something for a class – I missed this because I had to go to another meeting which I thought he would hate. And I was right! It was a bunch of adults fighting and being belligerent. So I dropped him off. I asked him what the students were filming and he responded “some crazy stuff.” Who knows what he learned from that. Or what the crazy stuff was. Yikes! Finally, he came with me to my bi-monthly visit with the Dean. Owen quietly played games in the corner and thus missed hearing enough confidential information and sensitive subjects to make the paint peel. People would die to know what was said in that room. Except for my 12 year old son, who could care less. And I can’t blame him. Because at that age I didn’t want to know anything about hiring, firing, uprises, or salaries. I wanted to job shadow my Dad just to take a day off school, hang out, and learn about fast food. Did I just become someone’s inside joke?